Delhi High Court issued a new notification in PDF format on their official website related to the recruitment process for Judicial Assistant posts. All Indian well qualified Graduates candidates are eligible to apply for this Delhi High Court recruitment process 2019. All fresher applicants who have completed their Graduation are eligible to apply for this Delhi High Court recruitment 2019. More information related to these Government jobs in Delhi is given below in this article. Read the complete article till the end to know more about this Delhi High Court Recruitment process 2019. Pay Band: 5th Level of Pay Matrix per Month. Educational Requirement: Those who have completed one of the following qualification can apply: “BCA / B.Sc(Computer Science) / B.Sc. (Hons.) (Computer Science) / B.Tech (Computer Science) / MCA / M.Sc. (Computer Science) / M.Tech. (Computer Science) with at least 50% marks in aggregate. So those who lies in between this age criteria can apply for this recruitment process. A non-refundable online fee of Rs.300/- (Rupees Three Hundred Only) along with applicable transaction charges will be payable by General as well as OBC applicants. Rs.150/- (Rupees One Hundred & Fifty Only) along with applicable transaction charges will be payable by the applicants belonging to the categories of SC/ST/Ex-Servicemen Persons with Disability suffering from disability OL (One Leg) or BL (Both Legs) or LV (Low Vision) or HH (Hearing Handicapped). No fee shall be charged from the candidates; who had already deposited fee in the earlier Junior Judicial Assistant (Technical) Examination-2015 conducted by this Court on 08.05.2016. However, the candidates (who were exempted from depositing fee in the earlier Examination) are required' to deposit fee of Rs.300/- or Rs.150/-, whichever is applicable owing to respective category of the applicants. 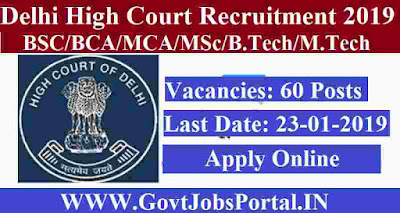 Application Forms for this Delhi High Court recruitment 2019 can be filled up through online mode. You have to visit to the official website of this Court, i.e., www.delhihighcourt.nic.in. We also share the direct link for online application under IMPORTANT LINK section at the last of this article. The applicants already in Government Service should intimate their Department/Office where they are serving ,and shall be required to produce No Objection Certificate at the time of Interview, if declared successful in the Written Test. 23rd Jan. 2019 is the Last Date to apply.